Autumn is Denver’s golden season. The days are often sparkling and sunny but cool, with a hint of the coming winter in the crisp night air. In Commons Park, the cottonwoods are coloring up, and the mast of the nearby Millennium Bridge points its shadow toward downtown. And in coffee shops and brewpubs, the conversation turns, of course, to football. Still, there’s more to this season than following the fortunes of the state’s gridiron heroes – such as some of the year’s best weather for hiking. Hit the parks on a Sunday, when Bronco fans are glued to their tubes, and you’ll have the trails practically all to yourself. Autumn is also prime time for major museum exhibits and the performing arts. In such a big football town, it’s fitting to make your first stop a pilgrimage to the Broncos’ home turf, where you can see the team’s Super Bowl trophies on the 75-minute Invesco Field at Mile High Tour (10-2 Thu-Sat, no Sat tours on home-game weekends; $7, $5 ages 3-12; 1701 Bryant St.; www.coloradosports.org or 720/258-3888). Then move on to more memorabilia in the Colorado Sports Hall of Fame Museum (10-3 Tue-Sat; free; inside Invesco Field; 720/258-3888). Try a bison burger. For down-home comfort food – blue-plate specials like pot roast, meat loaf, beer-can chicken, or even a bison burger – you’ll like Ted’s Montana Grill ($$; 1404 Larimer St.; 303/893-0654). Ranch kitsch and art. Pick up something for the inner cowpoke at Cry Baby Ranch (1422 Larimer; 303/623-3979), from Western-themed furnishings to cowboy boots, clothing, and jewelry. At William Matthews Gallery (closed Sun; 1617 Wazee St.; 303/534-1300), you’ll see watercolor scenes of ranch life, cowboys, and fly-fishing. Order the beef. The city’s top steakhouse, the Palm Restaurant ($$$$; 1672 Lawrence St.; 303/825-7256) has walls emblazoned with caricatures of famous patrons. Dance cowboy-style. Try the Texas two-step on a giant dance floor at the Grizzly Rose (closed Mon; $5 on weekends; 5450 N. Valley Hwy. ; 303/295-1330). A great place to kick off a day of museums, art, and culture is Annie’s Cafe ($; 4012 E. Eighth Ave.; 303/355-8197). The Denver omelet (called the Eighth Ave. here) is tasty and huge. Note the rows of lunch boxes overhead. See mummies. The ancient Egyptians were obsessed with the afterlife, which is the focus of an amazing exhibit called The Quest for Immortality: Treasures of Ancient Egypt (through Jan 23) at the Denver Museum of Nature & Science ($20, $14 ages 3-18; 2001 Colorado Blvd. ; www.dmns.org or 303/322-7009). You’ll see burial treasures and a tomb. Stroll a sculpture-filled garden. Among the reasons to swing by the Denver Botanic Gardens ($7.50, $4 students and ages 4-15; 1005 York St.; www.botanicgardens.org or 720/865-3500) in fall: autumn leaves, the tranquil water features in the Monet Garden, and a sculpture exhibit ($3), Chapungu: Custom and Legend; A Culture in Stone, by artists from Zimbabwe. Sports bites. Jackson’s Sports Rock ($; 1520 20th St.; 303/298-7625) is the place to catch your favorite college-football game on the tube. There are 55 televisions tuned to various games. Roam Riverfront. Pay a visit to one of Denver’s newest neighborhoods, the Riverfront Park area – roughly Little Raven Street to Platte Street, between 20th and 15th Streets. Check out the landmark Millennium Bridge (at the foot of 16th St.), then pick up stylish home accessories at Chateaux (1590 Little Raven St., Ste. 170; 303/629-9101) or hard-to-find wine vintages at Denver Cru (closed Sun; 1590 Little Raven, Ste. 175; 303/573-9463). Then stroll over the just-finished pedestrian bridge in Commons Park to gaze at the South Platte River below. Unusual fusion. Opened in February, Zengo ($$$$; dinner daily; 1610 Little Raven; 720/904-0965) is loud, trendy, and Denver’s brightest new star. Start with a cucumber mojito, then share the small plates – especially the ceviche, arepas de puerco (pulled pork served over corn cakes), and Peking rolls – that showcase chef-owner Richard Sandoval’s outrageous mix of Latin and Asian cuisines. A night at the theater. The largest theatrical-arts hub west of New York is the Denver Performing Arts Complex (tickets from $34; Speer Blvd. at Arapahoe St.; www.denvercenter.org or 800/641-1222). Moliere’s The Misanthrope runs October 14-November 13. Get a rocky start to your day at REI Denver Flagship (1416 Platte St.; 303/756-3100). Grab a breakfast sandwich at the store’s Starbucks cafe, then scale the 47-foot rock pinnacle that mimics local sandstone formations ($10; call for days and times). Hit the trail. Head out to Red Rocks Park & Amphitheatre (off Morrison Rd. in Morrison; www.redrocksonline.com or 303/697-4939), on the western edge of Denver, for a hike past sculpted rock and towering cottonwoods that splash bright leaves across the trail. Try the 3-mile loop trail that starts at the Trading Post and winds around mammoth red sandstone formations. Lunch at Red Rocks. Stop at the Red Rocks Underground Visitor Center, at the top of the amphitheater, for lunch at the Ship Rock Grille ($; 303/697-4939); try the salmon salad or venison sausage. If the weather’s nice, dine on the boulder-edged deck. Navigate the corn maze. On the way back downtown, detour to the Denver Botanic Gardens at Chatfield (8500 Deer Creek Canyon Rd., Littleton; 303/973-3705) and test your sense of direction in an intricate 5-acre maze (open 4-10 Fri, 10-10 Sat, noon-8 Sun through Oct 31; $8, $6 ages 3-15). Dine at Table 6. A casual dinner in a laid-back neighborhood cafe is a fine way to wind down the weekend. Alamo-Placito’s new Table 6 ($$; dinner daily; 609 Corona St.; 303/831-8800) has a bold seasonal menu, from seared albacore tuna to rabbit with grilled oyster mushrooms, bacon, napa cabbage, and sweet corn. Stay in Lower Downtown (LoDo) to be close to the action; most downtown hotels offer deep discounts on weekends. 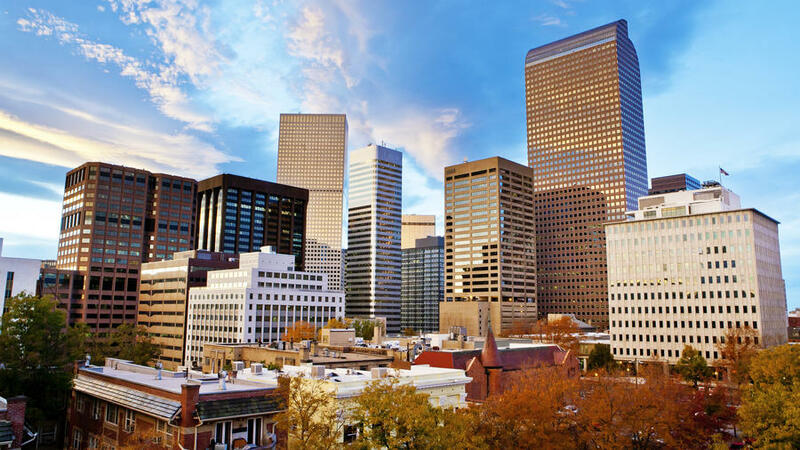 For travel-planning help, contact the Denver Metro Convention & Visitors Bureau (www.denver.org or 800/233-6837). Hotel Teatro. Well appointed – and wired – for business travel, this sleek, contemporary boutique hotel near the performing-arts center is impeccable. Don’t miss breakfast at Bistro Jou Jou ($). Ask about free downtown car service and weekend packages. 111 rooms from $255. 1100 14th St.; www.hotelteatro.com or 888/727-1200. The Luna Hotel. This small hotel in a restored 19th-century brick building has a cool vibe, low-key modern decor, and a great LoDo location. Ask about full-moon discounts and use the valet parking to avoid garage hassles. 19 rooms from $169. 1612 Wazee St.; www.thelunahotel.com, 866/724-5862, or 303/572-3300. Westin Tabor Center, Denver. Big (430 rooms), handy (it’s on the 16th Street Mall), and newly renovated ($8 million), the hotel has an indoor/outdoor pool and a new gym. Reward yourself post-workout with one of the 25 types of vodka served in V’s Lounge. From $119. 1672 Lawrence St.; www.westin.com or 303/572-9100.